Vandy Vans — two words that strike fear into the hearts of the punctual. They are not reliable, the routes are weird now, and they smell vaguely of Rocket Subs. But they are the best (that is, free) alternative to get from Point A to Point B in a downpour, so they have their charms. If you’re like me and remember a time when there was a functioning, standalone Vandy Van app, congratulations! We are now old. At the risk of sounding like a jaded upperclassmen from a pre-Caviar and Bananas era, let me review the shortcomings of both the broken app and the new website, along with my suggestions for fixing them. First off, the Home screen (Fig. 1) needs more utility. As a user, I want to find my information as quickly and easily as possible. The more I have to dig for the information, the wetter my phone gets in the pouring rain (as in the scenario I presented above). 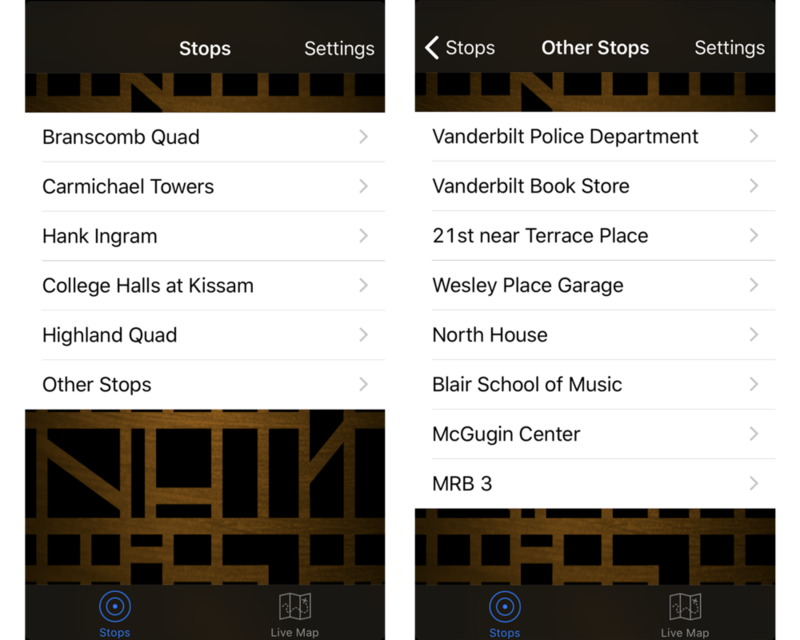 When I open the app, I am presented with a predetermined list of stops and “Other Stops.” Presumably, these 5 stops are the most popular. How do we know this? No clue. This assumes users mostly travel between residence halls, which is questionable and not reflective of my experience. When I click on a stop, I see times presented for each route. But I often have no idea which route I should take. Where is the “Red” van going? I know when it gets here, but will it take me where I need to go? Would “Black” be quicker? Which direction does it go? Ideally, I should see the chronology of stops so I can choose the most direct path to my destination. A map would fix this issue. Unfortunately, the Vandy Van app crashes when I try to open the map. That’s an architecture problem, and there’s little to say on that. I would like to note that I tried to report a bug, but that presented a bug. The new website is functionally better, but it also has flaws. First off, I would really love direct access to a map. There is a map, but it’s buried behind the route info, which also requires the user to know which route they want and which van serves a specific stop. A first time user is bound to get confused by the routes. Meanwhile, the app is cluttered with bits of data that detract from the essential information I need (“feature creep” in developer lingo). I never need to change the terrain of the map, learn the time stamp of the update, or know the van number. Why would I? It doesn’t serve the user’s need — to get on the right colored van. That’s it. It would be unfair to criticize and not propose a fix. I created some wireframes to visualize a few ideas. There are 4 major things that this app should allow users to do. Switch through maps easily using color-coded buttons for each route. Search for a destination and learn the fastest route. Tap on a stop to see ETAs for different routes. Hold down on the color-coded buttons to see a chronological list of stops. What would this look like as a high fidelity prototype? I'm glad you asked. This is a pretty simple loading screen with a new logo. It will take some time to load the map, but hopefully it would be quicker than drilling down to find more information. A map says it all — where the user is, where the vans are, and where the vans are going. That’s why a map should be the first thing to appear. It should be really easy to pick a route. The routes are labeled “Black,” “Red,” and “Gold.” So, it makes sense to color-code it. As the user clicks each button, they see the appropriate van and its current location. A search tool would be powerful. It would recommend the fastest route after users search for their destination. I foresee this being the most utilized tool in the app. The gestures on this app would be identical to most GPS applications (pinch to zoom, one finger to pan/tilt, etc.). When a stop is clicked, the user gets a mini-readout of the van ETAs with the selected route reading first. In the vans, they post printouts of the stops in chronological order, which is really useful. This information should be included in the app somewhere. In my version, if the user presses and holds the route buttons, they can see the stops in chronological order with approximate ETAs. On first use, I anticipate a hint letting the user know that this function exists. I wanted to build an app in one screen, give the users limited choices, and build a really clean UI. Thanks for reading!